The DJ Forry Company has been bringing the versatile persimmon to kitchen tables around the country for decades. Like all other produce we bring to market, we insist that our farming partners utilize the latest, most up to date farming and harvesting methods to ensure only the best and safest persimmons reach your table. Which Persimmon is for Me? There are two basic types of persimmons: astringent varieties used in baking, and non-astringent for eating out of hand. We bring to market the Hachiya variety for baking and the Fuyu variety for eating out of hand much like an apple. Whether you are looking for persimmons to cook or eat out of hand, make sure that they feel heavy for their size and aren’t bruised or shriveled. Keep your persimmons at room temperature until ready to eat. Fuyu persimmons will ripen up quickly at room temperature and are great eaten out of hand like an apple. They’re ready to eat when they yield to slight pressure in the palm of your hand. For years now, nutritionists have raved about the health benefits of fruit, especially those that are high in antioxidants, phytochemicals and flavonoids. Very seldom are persimmons mentioned in those conversations. Well, that needs to change. 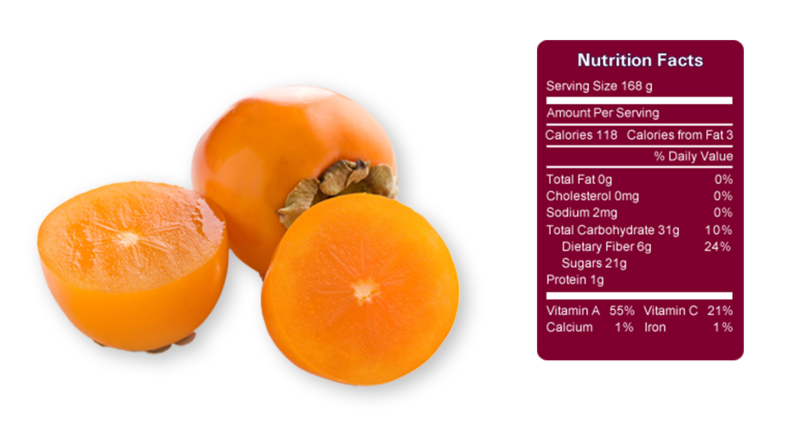 Persimmons are low in calories (70 cal/100g) and fats, but are a great source for dietary fiber. What you may not know is that persimmons contain many sought after phyto-nutrient flavonoids like antioxidant rich catechins and gallocatechins (tannins). Like the catechins found in green tea, they are known to have anti-inflammatory, and anti-hemorrhagic properties. Persimmons also contain cancer fighting betulic acids. Persimmons contain antioxidants like vitamin A, beta-carotene, lycopene, lutein, zeaxanthin, and cryptoxanthin. These antioxidants working together may help reduce the risk of AMD, or Age-related Macular Disease. Persimmons are also a great source for vitamin C, B complex vitamins, and minerals like potassium, manganese, copper, and phosphorus.